ChildFund Alliance and other NGO partners have just released a groundbreaking new report that, for the first time, attempts to understand global development spending as it pertains to violence against children. 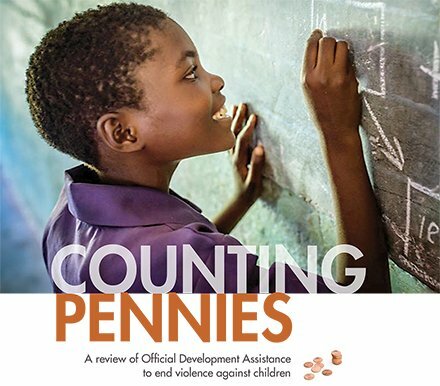 The Counting Pennies report is the first major body of research to illuminate the actual portion of development aid that is spent on protecting children from violence. Hitherto, there has been only been limited data to help child-focused NGO’s like ChildFund, understand how much attention is being given to this hugely important issue. Children represent the ‘now’ but they also represent the ‘future’. It is only by investing in children and putting in pace systems that protect and serve them can we hope to break the cycle of poverty, disadvantage and violence that afflicts our most vulnerable citizens. In 2015 world leaders signed up to the historic Global Goals, or Sustainable Development Goals as they are also known. The 17 goals are a road map, laying out a set of global priorities to make the world a more equitable and sustainable place by 2030. For the first time children’s rights have been explicitly named and adopted as one of these global priorities. This historic moment was a game changer for children. Protecting children from all forms of violence and exploitation is an issue that could not be more urgent. It is estimated that violence affects over a billion children in every country and every community on earth. It robs them of their dignity, rights and even their lives…It robs them of their dreams. Violence against children can take many forms – physical punishment, sexual violence and exploitation, trafficking, child labour and forced marriage to name but a few. The human cost of this violence is incalculable but thanks to earlier research we now know the economic cost and it is staggering – some $1 trillion yearly. If the world does not put an end to it we risk loosing the investments made in child survival, health, and education, thus eroding human and social capital and slowing economic development. The Counting Pennies report is the first detailed analysis of global spend on development aid, as it pertains to children. The results do not make for comfortable reading. in 2015 the total amount of Overseas Development Aid (ODA) spent globally was $174 billion. Of this sum, less than 0.6 percent was allocated to ending violence against children – a scourge than affects over one billion children. These findings tell us that while protection of children from violence is now an explicitly acknowledge global priority, this is not yet reflected in terms of prioritising development aid. ChildFund Alliance members like ChildFund Ireland work tirelessly to advocate for children so that their voices can be heard at the highest tables of influence. Our Free From violence campaign, and intense campaigning at UN level , helped influence the final wording of the SDG’s to reflect these priorities, under goal 16.2. Armed with the new information uncovered by the Counting Pennies report we can continue to push governments to abide by their responsibilities and protect children from violence and exploitation. Their commitment needs to be expressed in terms of investment in children both now and for the future.